It would be a crime to miss Elementary: The First Season, which includes all 23 episodes released on 6 discs for the first time on DVD. This modern-day twist on the legendary detective finds Sherlock Holmes (Jonny Lee Miller) as a recovering drug addict, starting a new life in New York City as an NYPD consultant. By his side is his trusty "sober companion", Dr. Joan Watson (Lucy Liu), hired by Sherlock's dad to keep the investigator on ..
Return to the scene of the crime in Elementary: The Second Season, with all 24 gripping episodes collected for the first time on DVD in this 6-disc collection. Jonny Lee Miller returns in this modern-day take on Sherlock Holmes, the dangerously eccentric consulting detective who's addicted to impossible cases. Lucy Liu stars as Dr. Joan Watson, his sober companion-turned-partner in detection. Together, they take on some of the strangest.. Perfect Crimes Meet the Perfect Match. In the City That Never Sleeps, one mind never rests. The eccentric detective Sherlock Holmes (Jonny Lee Miller) possesses an unquenchable thirst for intellectual puzzles and a ruthless instinct for justice. As a consulting detective to the NYPD, he takes on bizarre cases that baffle the most seasoned cops. But he can't do it alone. Holmes relies on Joan Watson (Lucy Liu), a former physician who's t.. 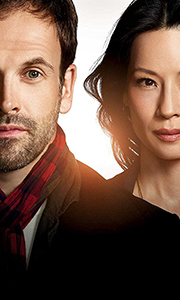 In Elementary, The Fourth Season, Sherlock Holmes (Johnny Lee Miller) and Dr. Joan Watson (Lucy Liu), re-ignite their unique chemistry - a relationship that allows them to solve an increasingly complex series of crimes in the Big Apple. But the worm in the Apple makes itself known when Sherlock's father, Morland Holmes (John Noble), arrives in NYC to live full-time. His apparent concern with his son's increasingly intense behaviour and ..
Own Elementary Season 6 DVD from Deff, DVD, Blu-Ray & 4K Video Specialists - Free UK Delivery..